Oh thank goodness...I was really thinking about how boring my summer was going to be with no Penguins hockey. Welcome, new reader, we are glad that you found your way to read the site. First off, I am a Pittsburgh Native. And a few other writers on this site are too, so let's not make this a who-knows-what about Pittsburgh, please. 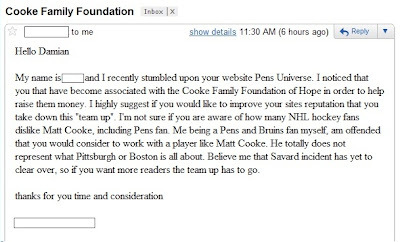 As I interpret this email you sent to us, it seems you would rather we not support a charity that Matt Cooke is involved with but you haven't clarified why or even justified your statement other than using the word "dislike". There are plenty of things we all dislike in the NHL, one of those things we don't care for is when a player repeatedly comes back from head injuries against better judgment. Can you tell me honestly that his decision to play again this year was a good idea? You also cite that hit on Savard being far from over. Really? That's what you have, eh? Name ONE Bruin that went to bat for Savard as he laid in a crumbled heap on the ice. Thorton needed WEEKS of prodding by his coach and teamates to finally ask for a dance from Cooke. Did Cooke skate away at any time? Nope. 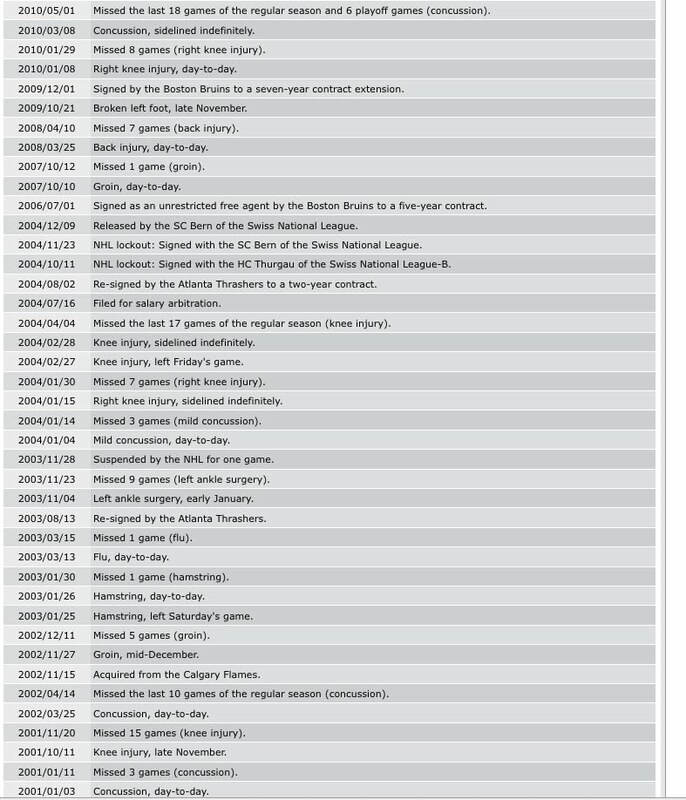 I am pretty sure Savard was the feel good story of that monumental collapse in Boston when the Flyers rolled them like an old carpet. Don't think for a second that Peter Chiarelli won't entertain the thought of making Cooke a contract offer. Don't give us any lip on how classy the Bruins are as an organization. It's tough to make that kind of statement when the team employed "The Rat" for quite a period of time. There are plenty of posts prior to this one stating how we value what each player brings to the table for the Penguins Organization. Matt Cooke absolutely falls under many of those categories at the current time. I would defend his hit again just as I have defended Andy Sutton's hit on Jordan Leopold. They were unfortunate, but legal by NHL standards. Here's the crux of the matter: we don't judge your humanity based on what you do at work. 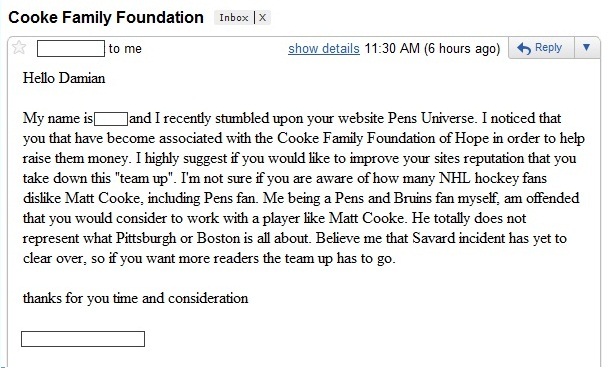 Who are you to judge Matt Cooke by what he does for a living? Under your premise, you don't support our Troops overseas because they may have to kill in the line of duty. Bottom line, we chose to team up with a player and his family to help a variety of causes that The Cooke Family Foundation of Hope supports. I might add that we also support The Mario Lemieux Foundation. Both players are family men, like several of us here at Pens Universe. What have you done for charity lately?